Suzuki Alto | What Car? 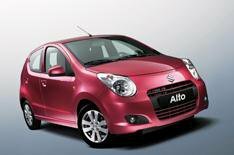 Suzuki has unveiled its Alto city car, which will go on sale in the UK in March 2009. It is powered by a 1.0-litre petrol engine which averages 62.7mpg and emits 103g/km of CO2. The engine is linked to a five-speed manual gearbox as standard, although a four-speed automatic gearbox is available as an option. The four-seater has been designed to look sporty, but achieve high fuel economy. As a result, its body shape has been sculpted in a wind tunnel to ensure maximum efficiency. Suzuki says an emphasis has been put on ensuring the ride and handling progressive and the steering light, while a turning circle of 4.5 metres adds to its appeal for city car users. Stability control, front, side and curtain airbags will all be on the car, although Suzuki has yet to set the full UK specification and prices. The Alto shares much of its structure with the Nissan Pixo, which is also in Paris. Both cars are being built in India, and are the first mass-produced cars that will be sold around the world to be built in the country.